This is my favorite time of year. I love getting up when it is really cool outside. Cool enough that I put on my bathrobe, and grab a pair of slippers. Or the fuzzy slipper socks. Only this time of year is also when I struggle to find a pair of anything. I already knew I had one gray slipper, and one bright blue slipper, and I have no idea what happened to the other half of either pair. So this morning I went to grab slipper socks. Okay, so I straightened them out a bit to take the picture. But those are the slipper socks I found, in the order I found them. I did finally find two pairs, once I went to the basket of clean clothes that hasn't been sorted. There was a black one, and a red patterned one in there. So I am wearing a matching pair right now, and can put one on tomorrow too. I keep thinking there is probably some sort of message in this. 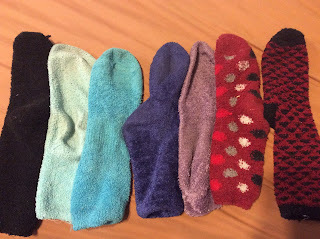 Like maybe it is time I start actually pairing stuff up when it comes out of the dryer, or that I need to go find a 20-pack of identical slipper socks so I don't have to worry about it. Or maybe it is that getting a job done is more important than what that all looks like. Appearances don't matter so much. I think my husband is the only person in the house who *always* has matching socks.